As North America’s largest independent coffee and tea producer, Mother Parkers’ RealCup brand has become an industry leader in the booming single-serve capsule market. The launch of its EcoCup, the first recyclable K-Cup compatible single-serve capsule, was a groundbreaking step in shaping the sustainable future of this growing industry. Mother Parkers Tea & Coffee Inc. blends and roasts tea, coffee, and other beverages for retailers, brand owners, and companies in North America. Brown & Cohen joined a multi-agency team about two weeks prior to the April launch to handle Canadian PR and to provide strategic communications advice from a Canadian perspective on a team comprised of mainly American agencies. We provided tactical input to the launch strategy, helped craft the media release and media-trained members of the executive. Above all, we ensured the company reinforced its commitment to sustainability, its philosophy for creating solutions and built momentum towards EcoCup Coffee, which would be launched a few months later to an even larger market. • Over 20 million impressions via online, TV, radio and print in the major markets across Canada over a period of one month. • Top tier media included CTV News and Canadian Business Magazine. 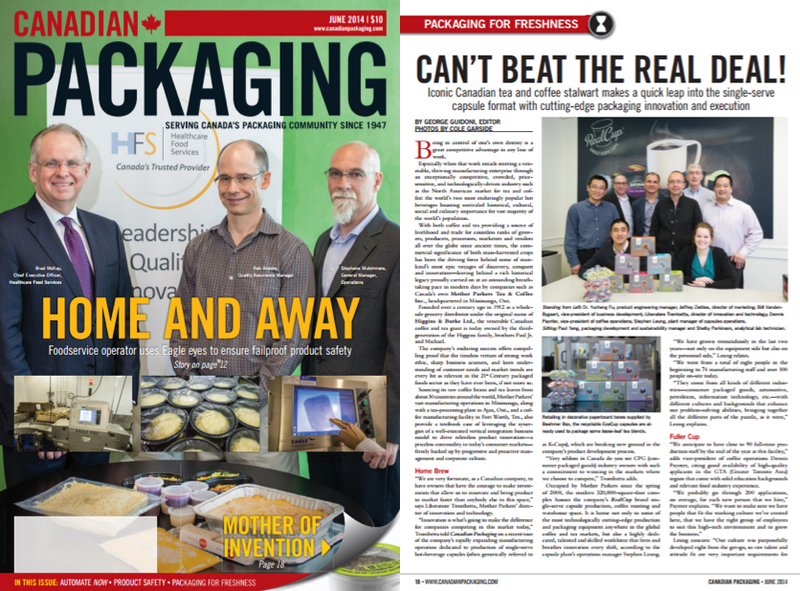 • Canadian Packaging Magazine front cover called Mother Parkers “The Mother of innovation” as part of a multi-page feature on its commitment to sustainable packaging.